Join Scott and Shanti Medina along with their amazing band including Eyal Rivlin and Gayan Gregory Long for an evening of ecstatic chant woven with embodied practices and mindful meditations from traditions around the globe. 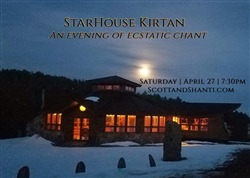 We join together in the heart of StarHouse chanting in the round within the womb of this beautiful and sacred mountain temple. Directions to the StarHouse: The StarHouse is located 3.5 miles west of Boulder up Sunshine Canyon. From 4th Street and Mapleton Avenue in Boulder, drive west on Mapleton Avenue (which turns into "Sunshine Canyon") about 3.5 miles. Turn right at the sign that reads "3476." You'll drive up the driveway. Parking is clearly marked at the *top* of the hill. After parking, walk down the other side of the hill, towards the StarHouse, which you'll soon see through the trees. Please wear shoes appropriate for a short walk through a forest (you'll be taking them off once inside the StarHouse), and bring a flashlight to help.